CEATECH only sell high quality silicone soldering mat. You won't know you need it until you have one! Moreover, it's a precious present for your farther or friends. 1.Large Size - 17.7'' x 11.8'' giving plenty of working area. 3.Magnetic mat hold strongly the tiny screws, do not lose. 4.non-toxic and odorless: material 100% food grade which meet USA FDA standard. 5.Anti-slip, soft silicone mat preventing getting scratched on surface. Especially for circuit boards have delicate soldering on the back side. 6.Multi-role: not only protect your working table, also can be flexible used in your daily life ,like for your cooking pan, or for your baking house, ironing boards, hair salon ect anywhere you think it can be as heat insulation mat. 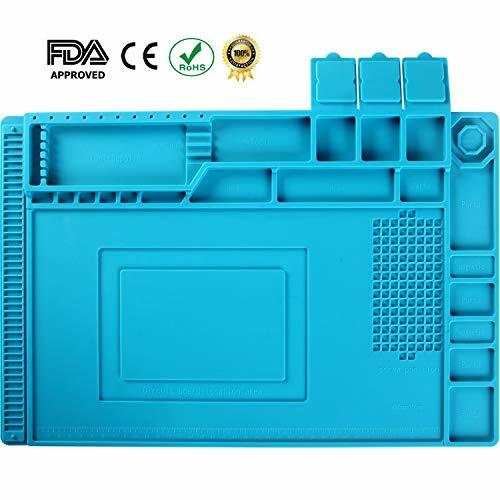 【Silicone Repair Mat 】It is an ideal silicone repair mat for soldering electronics assembly or electronics and circuit board repair, like for cell phone, laptop, computer, sports watch, camera, smart toy, eyeglasses etc. 【Excellent Heat Resistant Performance】 The high quality heat insulation maintenance desk mat can be heat resistance high temperature 932°F(500℃), which protect your maintenance platform from high temperature burnout and damage.. The soldering iron can directly solder in the mat. 【Multifunctional】 To make your repair work easy, the mat built-in scale ruler (0 ~36 cm), 124 screws position and multiple magnetic notches to classify IC chips, small parts and screws. They will improve your work efficiency and keep maintenance platform clean and tidy. The magnetic notches and 3 parts box keep small parts not lose and 11 Screwdriver slot is great to place your small screwdrivers. 【Big Size Mat】 The large soldering mat with size 17.7'' x 11.8''(45cm x 30cm ) provide bigger space to satisfy your many projects repairing demands. It's great for professional repair store, DIY handyman and electronics workshop. 【Non-toxic and Odorless】 Silicone mat material is 100% food grade which meet USA FDA standard, non-toxic and odorless .With sturdy and durable features, it's no problem with service life of 10 to 15 years if standard use. And it's easy to clean by water. If you have any questions about this product by CEATECH, contact us by completing and submitting the form below. If you are looking for a specif part number, please include it with your message.